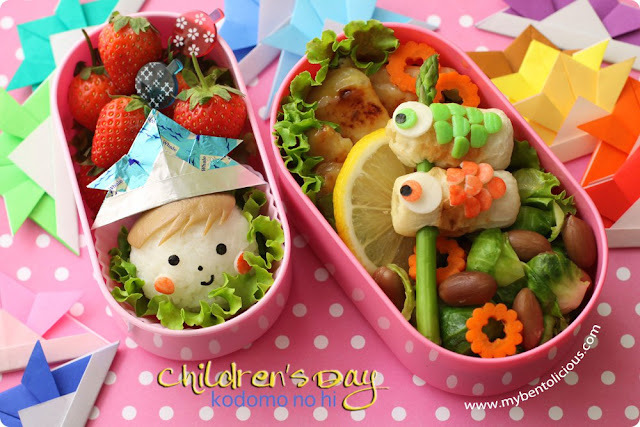 Kodomo no hi (Children's Day in Japan) fall on 5th of May and is one of the most popular national holidays in Japan. Kodomo no hi actually started long ago as Tango no Sekku (Boy's Day), a holiday celebrating the male children. After World War II it was changed to celebrate the health and growth of all children, in hopes of uplifting the spirits of Japan. Many of the traditions and decorations related to Children's Day still reflect those of Boy's Day. To bring good fortune to the boys in home, koinobori (colorful carp streamers) are flown outside of housed to wish them luck for the future. Koinobori are believed to be strong, spirited fish that are known for their determination in fighting up streams and through powerful waterfalls. Families also display kabuto (samurai helmet) and samurai dolls representing Kintaro, Momotaro and others that symbolize courage. Another tradition is the offering of kashiwa-mochi, a rice cake stuffed with bean paste and wrapped in an oak leaf, which is also a symbol of strength. Iris flowers also bloom during this time, and are place in the home to ward off evil. Children's Day celebrated in Indonesia on 23 July but we don't celebrate the event as big as in Japan. Some schools may have some special event on that day to celebrate but usually just a small one. My kids were excited last night when I asked them to help me make the kabuto origami that you can see in the background. I also prepared one for today's bento from aluminum foil paper. Inside the box : rice, strawberries, fish fillet cooked with mango sauce, brusell sprouts & braise peanuts cooked in sweet sauce, carrots, chikuwa, asparagus, and lemon. Great origami job, hehe! Love the cute boy, and the chikuwa fish are such a great idea on their asparagus pole. Happy Children's day to A and A! That was really interesting reading all of that. The little fish are awesome! I think kodomo no hi is a nice festival. In Germany we don't have a day where the children were celebrated. But I know a little japanese kid and his family, and I'm sure they will celebrate it ^-^ Sometimes there is an official kodomo no hi celebration in our Japanese Garden, but I don't know if there is one this year, too. Your bento is really cute! I love the koinobori the most ^-^ Great way to make them. Now I know Japan celebrates Children's Day on 5 May and Indonesia 23 Jul. Singapore is 1 Oct. I like the cute boy and the origami hat! May 5th is a national holiday here too: celebrating our freedom! OMG this is a beautiful bento!!! I love the carp streamers, so expertly done! Happy Children's Day! Kawaii nei! Yes, our Kodomo no hi fall on 1st Oct and there is school holiday for primary school only. The cute boy looks so handsome with that kabuto on it. Very creative as always, Lia. Very nice bento !! I haven't tried making bento, but I should! they're so cute! my gosh..those fish! arent they cute lil things?? and that boy's hair..the color..love it! Lia, when u made one beautiful bento before..i thot u can't top that..but, again..another masterpiece of yours..Love this one..my Fave! Hello Lia, I really don't know what to say. You are extreme MARVELLOUS! i love that boy with his cute origami. Mbak, u always makes perfectly details on ur bento. Honestly, i'm jealous with ur talent, meanwhile, i learn many things of ur bento & ur skill. Happy Kodomo no hi !! @The Bargowo : Thanks a lot Menoq for your nice comment! Keep learning and keep making it ... I'm sure you will make a lot of perfect bento too soon :) Semangat!! eek, the paper (and foil) hats are so cute and precisely folded! wonderful to use the asparagus stalk as the pole for the carp streamers, and i love that you haven't sacrificed tasty food to fit this adorable theme! This is adorable!!! I love that you made koinobori out of chikuwa. How fitting. Hehe :) Very creative. @lovefordinner : Thanks a lot for your kind words!